The Center for the Advanced Study of Human Paleobiology (CASHP) is a research center at the George Washington University. CASHP’s Mission is to undertake research that addresses fundamental problems in human evolution that cross disciplinary boundaries, to act as a catalyst for research involving scientists from other centers around the world, and to promote interdisciplinary research through training and education. CASHP brings together faculty from the Departments of Anthropology, Biology, Engineering and Applied Sciences, Forensic Science, Speech and Hearing Science, Philosophy, and Anatomy and Regenerative Biology at the George Washington University. CASHP is also closely linked with the Human Origins Program of the Smithsonian Institution, the College of Medicine at Howard University, Johns Hopkins University, and the Carnegie Institution of Washington. 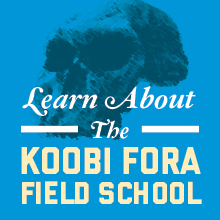 CASHP is home to the Human Paleobiology Graduate Program at the George Washington University.